Founded in the thirteenth century in southern France, the Order of Preachers quickly took interest in Middle East, where the Order soon settled: in Constantinople, Tunisia, Baghdad, and later in Mosul. Dominican masters in Theology owe their knowledge of Aristotle to Arab scholars: Albert the Great and Thomas Aquinas wrote commentaries on Averroes and Avicenna. In Cairo, the Dominican priory is established since 1928. Founded by Antonin Jaussen, o.p. (1871-1962, featured), this priory was meant to be an extension in Egypt of the École Biblique de Jérusalem, and devoted to the study of archeology in Egypt in connection with Biblical studies. Unfortunately, international events blocked the project. When, in 1937, Dominican friars decided to dedicate themselves to Islamic studies, Cairo seemed to them the ideal location: the prestigious University of al-Azhar is in Cairo; also, Egyptian culture has a prominent place throughout the Arab world. 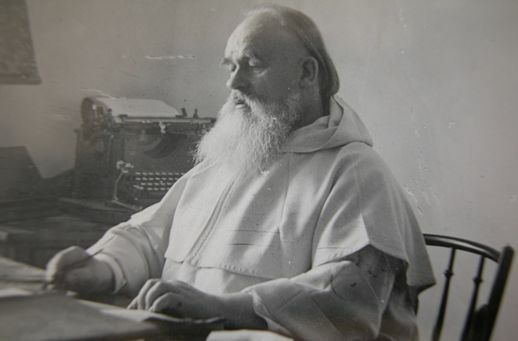 The intuition of the three founding friars, Georges Anawati, Jacques Jomier and Serge de Beaurecueil, was met by the Vatican’s call for religious to take Islam seriously; not to convert Muslims but to make Islam better known and appreciated in its religious and spiritual dimensions. These three started their work after World War II, at the beginning of the1950’s, and founded on March 7, 1953 the Dominican Institute of Oriental Studies (IDEO); today, a well-known research institute mainly dedicated to the sources of Arab and Islamic civilization.